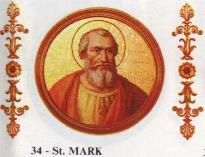 Pope Saint Mark or Marcus (Unknown – October 7, 336) was pope from January 18, 336 to October 7, 336. The successor of Sylvester I, who had reigned 21 years, Mark's time as the bishop of Rome lasted less than a year. Before coming to the papacy, Mark was apparently an important leader of the Roman church dating back to the time of Pope Miltiades. He thus lived through the period of Christianity's transition from being a persecuted sect to its status as the favored religion of the Roman empire. He also seems to have had a role in the early stages of the Donatist controversy and certainly witnessed Emperor Constantine I's generosity to the Roman church, as well as the emperor's calling of the Council of Nicaea, his later vacillation on the Arian controversy, and his moving of the capital of the Roman Empire to Byzantium. Some evidence suggests that the early lists of bishops and martyrs known as the Depositio episcoporum and Depositio martyrum were begun during Mark's pontificate. Mark also is said to have issued a constitution confirming the power of the bishop of Ostia to consecrate newly elected popes and is credited with the foundation of the basilica of San Marco in Rome and the Juxta Pallacinis basilica just outside the city. Mark died of natural causes and was buried in the Catacomb of Balbina. His feast day is on October 7. The Liber Pontificalis says that Mark was a Roman, and that his father's name was Priscus. Little is known of his younger days, but it seems that Mark had been an important figure in the Roman church for several decades before becoming pope. Constantine the Great's letter to the Roman church's leaders (c. 314), which summoned a conference of bishop for the investigation of the Donatist dispute, is directed to Pope Miltiades, but also to a certain "Mark" (Eusebius, Church History X.5). This Mark was evidently a key member of the Roman clergy, either a well-known presbyter or first deacon, and is likely identical with the later pope. 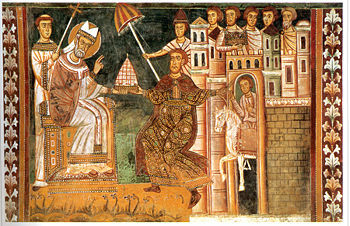 Mark's predecessor, Pope Sylvester I blesses Constantine I. At Rome, Mark must have take an active role in the remarkable transition of the church from a persecuted sect to the emperor's favored religion. He may have witnessed the triumphal entry of Constantine I as a new convert into Rome in 312 and must have rejoiced with his fellow Christians at the Edict of Milan in 313, officially establishing the toleration of Christianity and restoring the properties confiscated in recent persecutions. If he was a chief deacon, he may even have administered the process in Rome. It is likely that he was present at the time of Constantine's giving the Lateran Palace to Pope Miltiades as the papal residence, where Mark himself would later live. We do not know what role if any, he had in the Council of Arles at which the Donatists were first condemned, but since Constantine's letter seems to have been directed to him, Mark may have had some role in organizing or participating in it. The Donatists took the view that the ordination of clergy by bishops who had cooperated with the pagan emperors should be considered invalid. This policy was condemned in Miltiades' day as heretical, leading to a major schism that would last well into the next century. In 321, Mark must have heard of the decree of Constantine declaring Sunday to be a state "day of rest," at the same time further distancing the Christian church from the "detestable" Jews. Controversy continued to challenge the church, meanwhile, with regard to the treatment of those who had committed apostasy during the previous persecutions. The Novatianists, who were noted for their commitment to die rather than compromise with the pagan emperors and who refused communion to former apostates, continued to be a respected presence both in Rome and elsewhere in the empire. The Arian controversy also broke out during this period. Although no documents exist specifying Mark's position on this issue, it is likely that he supported the view of his fellow Roman churchmen that Christ not only pre-existed his Incarnation, but that he existed eternally with God the Father, with whom he shared the "same substance." The Arians on the other hand, took the view that Christ was of a "like substance" with the Father and that, although he pre-existed with the Father as the Logos, he had come into being at a certain point in time, rather than being "eternally begotten" by the Father. No doubt Mark heard the news of the Council of Nicaea in 325, and in 326 it is likely that he stood by as Sylvester I consecrated the Basilica of Saint Peter which had been built by Constantine over the tomb of the Apostle. Perhaps he had the opportunity of reading the Easter letter of bishop Athanasius of Alexandria in which Athanasius specified the 27 Christian books and letters which later became the authoritative list of the New Testament canon. We can imagine the mixed emotions he may have felt when the emperor moved the capital of the Roman Empire to Byzantium, renaming it "New Rome." Finally, Mark must have felt deep concern to hear in 335 that a synod of church leaders in Jerusalem had reversed Nicaea's condemnation of Arius and that Constantine, under the influence of the new patriarch of Constantinople, Eusebius of Nicomedia, had agreed to the banishment of the erstwhile anti-Arian leader Athanasius. The date of Mark's election, (January 18, 336) is given in the Liberian Catalogue of popes and is considered historically certain. So is the day of his death (October 7 of the same year) that is specified in the Depositio episcoporum, which is nearly contemporaneous with him. 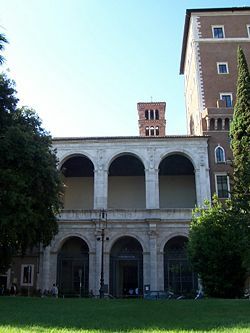 Although the current Church of San Marco in Rome does not date to Pope Mark's day, he is credited with its original construction. Two decrees are attributed to Mark by the author of the Liber Pontificalis. According to the one, he invested the bishop of Ostia with the pallium as the symbol of papal authority and ordained that this bishop was to consecrate the future bishops of Rome. It is certain that, towards the end of the fourth century, the bishop of Ostia indeed bestowed the episcopal consecration upon the newly-elected pope. Saint Augustine expressly bears witness to this (Breviarium Collationis, III, 16). Thus, it is possible that Mark had confirmed this privilege by an official decree. However, it is also known that the bishop of Ostia usually consecrated the new pope even before this time. Since the Liber Pontificalis is notorious for its anachronisms regarding papal institutions, however, the report must be treated cautiously. As for the bestowal of the pallium, this account cannot be established from sources of the fourth century, since the oldest memorials which show this badge, in the form of a white stole which the pope himself also wore, belong to the fifth and sixth centuries. The oldest written mention outside the Liber Pontificalis of a pope bestowing the pallium dates from the sixth century. The "Liber Pontificalis" remarks further of Pope Mark that "he made regulation(s) for the whole church." However, we do not know to which constitutions this refers. During the time in question, churches elsewhere indeed looked to Rome for leadership in resolving controversies, but the papacy had not yet emerged as an institution with the authority to dictate policy to the "whole church." Mark is also said to have been responsible for the construction of two buildings. One of these was built within the city and is identified with the present church of San Marco, being named after the pope's namesake Mark the Evangelist. It is mentioned in the fifth century as a Roman titular church. The other was outside the city and was a cemetery church, which the pope caused to be constructed over the Catacomb of Balbina, between the Via Appia and the Via Ardeatina. Pope Mark obtained gifts of land and liturgical furniture for both basilicas from Constantine I. Thus it does not appear that either Constantine's moving his capital to Byzantium or his change of heart toward the Arians affected his willingness to show generosity toward the Roman church. Mark was buried in the Catacomb of Balbina, where he had built the cemetery church. His grave is expressly mentioned as being located there in the itineraries of pilgrims of the seventh century. The feast of the deceased pope was given on October 7 in the old Roman calendar of feasts, which was also inserted in the "Martyrologium Hieronymianum". It is still kept on the same date. A laudatory poem to a certain Saint Mark of this period was composed by the order of Pope Damasus I and is preserved in an ancient manuscript, although scholars are divided as to whether it refers to Pope Mark. A purported letter to him by Athanasius is now considered to be a forgery. This page was last modified on 22 May 2015, at 19:49.